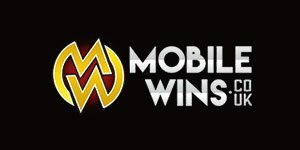 Mobile Wins Casino will then reward you with a bonus (Welcome Bonus is for new players only). The terms and conditions of the bonuses vary between different casinos and might also change over time and between different countries, so it is important to compare the different offers and read the T&C for Mobile Wins Casino before signing up. Another high-class online casino is before you. Mobile Wins Casino is a supreme place to gamble online and puts in an extra effort in its visuals. With the upholstered black background upon which all games are taking place, the site resonates with sophistication and class. The online gambling venue is also very flexible and adaptable, so you can enjoy the vast majority of the games on your smartphone or tablet from wherever you would like. Protected with SSL encryption, regularly audited and having met the requirements of the UK Gambling Commission and the Malta Gaming Authority, Mobile Wins Casino is a promising and safe place to gamble at. ProgressPlay Limited Casinos are the owner of this stunning online casino launched in 2014. As every cloud has a silver lining and vice versa, there is one bit that might bother some players. There are a lot of restricted countries in Mobile Wins books. Players from about 150 worldwide, including the United States, the Balkans, southern and southern-west Asia, the majority of Africa and several oceanic countries, currently cannot access the content on the website. UK players, however, are more than welcome. Mobile Wins Casino features an extensive line of various games from slots, casino games, jackpots and a fantastic live dealer department. Top class game suppliers power its portfolio, including Microgaming, NextGen Gaming, NetEnt, 1×2 Gaming and Genesis Gaming, to mention just some of them. Mobile Wins boasts exclusive content from the giant Microgaming, so all fans of this developer gladly visit this online casino. As a registered user, you get unlimited access to all of Mobile Wins Casino games, most copious and popular of which are naturally – slots. Around 300 popular and freshly released video slots are waiting for you! There are many branded titles like Game of Thrones online slot and Ted, and the newest addition to the portfolio is the shivering Snowflakes slot! Some other fantastic games you can play on here include Foxin’ Wins, Jungle Jim, lively and colourful Carnaval, Bar Bar Black Sheep and Warlords: Crystals of Power. The slot collection expands to cover about a dozen progressive jackpots that include the ultra rewarding Divine Fortune, Cash Splash, King Cashalot, Chilli Gold and Fruit Fiesta. It might be a hard wheel to try to turn, but Mobile Wins Casino does a remarkable job catching up with the competition regarding its virtual table games offering. At this elegant casino, you will find a broad diapason of the popular type of game many a player loves. The collection includes the classics – Baccarat, Blackjack and Roulette – but also manifold their variants. Therefore, you can test your luck with over 30 titles in the likes of Baccarat Gold, Deuces Wild Poker, European Roulette, Louisiana Double and Royal Roulette, to name a few. Overall, the selection is very diverse and you are likely to find some titles you will not find anywhere else. Virtually just as diverse and abundant as the slot library, scratch cards collection mesmerises all fans of the popular game. At Mobile Wins Casino you will find numerous popular and new titles like Sunset Delights, Boss the Lotto, fast-paced Turning Totems, Germinator, Golden Ghouls, attractive Diamond Deal, and spooky Monster Wins Scratch. You will also be able to enjoy the amazing James Dean game with the actor’s pictures all over the board. 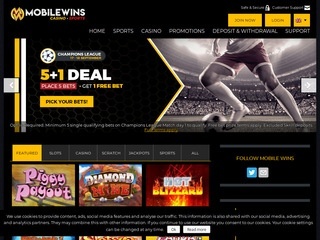 For lovers of authentic traditional gambling with a twist, Mobile Wins Casino offers incredible Live Dealer section where you can enjoy realistic live gambling streamed from a professional casino studio, from the comfort of your sofa. Face a real dealer in real time and even choose to talk to him or her, live. The games offered at Mobile Wins Casino include Live Baccarat, Live Blackjack and Live Roulette, both single- and multi-player, and you can play all of these around the clock, whenever you feel like it. Payment has been made easy at Mobile Wins Casino. For both wagering and withdrawing you get a variety of the most popular options available on the market. When depositing you can go for various debit and credit cards (MasterCard, Visa) and ewallets (Neteller, Skrill, Ideal, Ukash, PaySafeCard), as well as the Pay by Phone method and Discover. To withdraw cash, you can use all of the above-mentioned options, but also bank wire transfer. Ewallets are the fastest to process, never taking more than 48 hours, whilst bank wire transfers usually take from 5 to 11 days. The withdrawal limit is 3,000 per month, and the currencies available are British pounds sterling, Euros, American dollars, Canadian dollars, Australian dollars, New Zealand dollars. The minimum withdrawal is 20 for all means except for bank wire transfers for which it totals 50. If at any point you need assistance while playing at Mobile Wins Casino, its customer support team is available through a variety of communication options. Most players opt for the Live Chat, via which you can chat with a representative from 6 AM to 11 PM GMT. If the matter is not urgent, you can send your enquiry to [email protected] and expect a reply within 24 hours.